SayWhatNews: Good morning Shenell. Thanks for speaking with SayWhatNews. Tell us who is Shenell Edmonds? Shenell: Shenell Edmonds is an outgoing 17 year old actress born on April 26th, 1994, from Hamden, CT who considers herself American/West Indian as her dad is American and her mom is West Indian. SayWhatNews: You started acting at the tender age of 6. How did you know you wanted to be an actress? 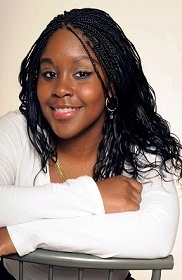 Shenell: I come from a very encouraging and talented family where music, dancing and performing is the norm. I loved mimicking the shows on TV and if I had seen the show before I apparently memorized the lines, song, and dance moves and would be doing it with them. My grandma gave me a birthday gift at age 5 to attend an acting class for kids and I remember having an awesome time with it. At any function: family, school, social – I would end up the center of attention. LOL. SayWhatNews: Shenell your love of dancing and acting took you to the Children's Theater. Which plays did you perform in? Shenell: I performed in Wizard of Oz, Winnie the Pooh – A Christmas Tail, The King & I & Goldilocks – The Trial. I also did some performances with Yale’s Children’s Theatre – Hands On! where the kids worked with drama students from Yale and created our very own plays at the end of each session. SayWhatNews: What is your most memorable memory being on the stage at the Children's Theater? Shenell: My most memorable memory being on the stage was during Swinging Stars Theater Camp where I shared the role of “Jim” in Treasure Island with another female camper and we both executed the role with perfection. My mom didn’t even recognize me on the stage, she said she knew that was supposed to be our role but whenever either of us came up she couldn’t believe that it was us acting as a boy and performing so well. SayWhatNews: Your career began doing radio commercials. Do you remember any of the lines and were there any funny ones? Shenell: “I want a hot dog AND a hamburger dog!”, this was a one liner for a Lowe’s radio commercial advertising grills. It was also funny because the male character asked who wants a hamburger or who wants a hotdog, my character asked for BOTH! SayWhatNews: I hear you appeared in some music videos for underground bands. Tell us what that was like and which bands did you work with? Shenell: Rehearsal days were lots of fun, long tape days and lots of start & stop. None of it phased me because I got to dance, move around and meet new people. The videos were recorded without the bands present, one band was Crystal Castles from Canada where I had on the weirdest make-up and outfits. Another video was for LUFF, a rock band out of Brooklyn. 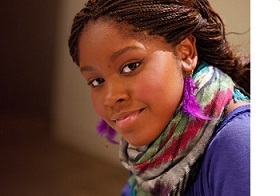 SayWhatNews: Shenell, everyone knows you as Destiny Evans on One Life to Live. How did you learn about the part? Shenell: My agent contacted me to inform me of an audition for a soap. I went on the audition and later that evening the agent called to say I had a call back the next day. Went to the call back, auditioned for the Executive Producer, Frank Valentini, and then Frank called in the Head Writer, Ron Carlivati and had me do the sides again. I had no idea that I would be on the soap for that long, it started off as a high school student in a recurring role. I feel truly blessed. SayWhatNews: Us Soap fans were very happy that they extended your role. The character was a breath of fresh air for the teens on the show. How amazing is it working with Sean Ringgold who plays Shaun Evans your characters brother who is really your Uncle? The chemistry between you two is so amazing that you would think you were really related. Shenell: The chemistry has been there from the day we found out that he was going to be my on screen “big brother”. Sean reminds me of my dad because of his stature. (LOL). He takes care of me like I’m his little sister and has established a relationship with my family to keep an eye on me while I’m in the studio and at events. SayWhatNews: Yeah, he seems like a great guy. We always hear that Soap acting is totally different from acting in movies and TV. How hard was it for you to learn the ways of the Soap world and memorize those long scripts? Shenell: The entire cast & crew took me in with open arms and I received advice from everyone. It is a completely different world, you are practically in character from the time you walk into the studio. The tape day starts with an overhead announcement: Good Morning Llanview! Go figure. The first time I heard that I thought it was hilarious but I think it’s done as a reminder that you are not in Manhattan anymore, you are in Llanview, Pennsylvania, home town of One Life to Live. SayWhatNews: Now Shenell, Destiny and Matthew Buchanan played by Eddie Alderson have been BFF's for a long time and recently their relationship has changed to being more than friends. Did you find it scary or awkward as a teen doing a kissing/love scene? Shenell: I didn’t find it scary or awkward, we joke around all the time. Eddie and I are friends, we attend the same school so it makes it easier, he isn’t a stranger. SayWhatNews: Your character Destiny is now experiencing being pregnant at a young age and deciding whether to keep the baby while Matthew is in a coma. How did you find those feelings within (being confused/scared) to portray so well on screen? Shenell: I thought about what I would do if this was my reality and brought that to the screen. SayWhatNews: Are you finding it hard to portray being pregnant when you have never experienced it yourself? Shenell: I wasn’t sure how I would be able to pull it off but I asked the moms in my family, had conversations with Kristen Alderson (Starr), who had a teenage pregnancy story line a few years ago also and then I put it all together and went with the flow of things. SayWhatNews: Sadly, One Life to Live has been canceled by ABC. What was the mood on the set when the announcement was made? And what do you want to say to all the Destiny and Matthew fans out there? Shenell: I wasn’t working the day of the announcement and for a couple of days after. And to all the Destiny & Matthew fans out there, thank you for your continued support, it means the world to us that you are enjoying the characters and our acting. SayWhatNews: Have you heard anything about ABC licensing the rights to One Life to Live to Prospect Park to air online and what does it mean for our favorite characters? Shenell: An announcement was made by both ABC & Prospect Park regarding the move to online but we do not have any details as far as what it means for your favorite characters. Hopefully all our fans will follow us no matter where we go. SayWhatNews: Um most definitely. As for me I don't know what I am going to do at 2 o'clock. LOL Just recently you had the 2nd Annual Fan Club Celebration where you danced and partied with fans. How important is it to you to spend time with your fans? Shenell: It is very important for me to spend time with my fans because if it’s one thing that I’ve learned being on the soap for a little over 2.5 years is that the fans have a lot to do with who stays and who goes. I want to show them that I appreciate their support and I am very down to earth. I want to give them the opportunity to meet and mingle with me in the real world. 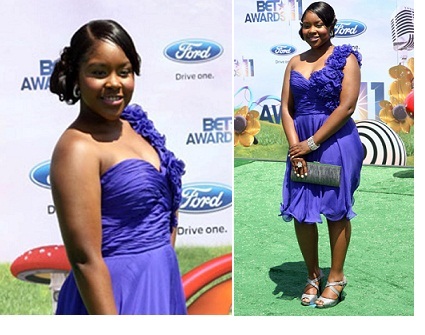 SayWhatNews: Congrats on your 2011 nomination for BET Young Star Award. You were stunning and your dress was so beautiful, who were you wearing? Shenell: Thanks, that nomination was a total surprise and I felt very blessed for being in a category with such well known Young Stars. My dress was by Jovani Couture, NYC. Thanks Kelly Brown! 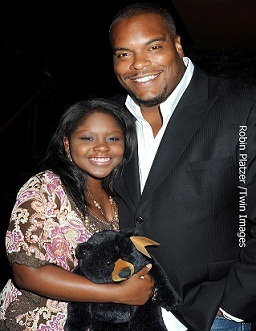 SayWhatNews: Shenell, you are close friends with Kelley Missal who plays Danielle on OLTL. What do you girls like to do for fun when you’re not working on the set? Shenell: We love to laugh and dance. She came to my fan club party and we tore up the dance floor! We hang out in the city after work sometimes also. SayWhatNews: Your first and only film to date was 'Couples Only' a Columbia University Short. Do have plans to do more films or even made for TV movies? Shenell: I sure hope so! If it’s in my “Destiny”, then so shall it be. LOL. I would like to be a very diverse actor doing TV, movies, commercials, theatre, etc. SayWhatNews: Shenell, you along with fellow OLTV co-stars Eddie Alderson (Matthew) and Kelley Missal (Danielle) participated in Good Morning America's Coat Drive. How important is it to you to help give back and support a cause? Shenell: It is very important to me to give back and support a cause; it takes one action to cause a chain reaction. The coat drive was one of the simplest things I could do to help someone stay warm during the winter. My family volunteers for different community events. We also participate in the American Cancer Society walk in October as our family has experienced losing loved ones to cancer. The hardest one was the passing of my Aunt Geraldine who was one of my biggest supporters from day one, she’s my very own personal Angel up above. I also have another Aunt who is a survivor. During this summer I volunteered at a school called Still Waters in a Storm in Brooklyn, NY. SayWhatNews: Besides dancing and acting what else do you like to do? Shenell: I love to travel especially to the island of Dominica where my mom and her family are from. I enjoy cooking – although I’m still learning and don’t really care for the clean up afterwards. I like to do hair; my little sister and cousins are always asking me to do their hair and spending time with family. We are an active bunch! SayWhatNews: What's next for Shenell Edmonds? Shenell: Next is graduating from High School in 2012, applying and going to college and hopefully more acting opportunities.